Conjure up a mental picture of a marathoner, and you’ll most likely envision an image similar to that which is often depicted on TV or in magazines: someone drenched in sweat, tendons straining, visibly defined musculature rippling and on the brink of exhaustion. Well, make room for a more unconventional picture – one with fewer rippling muscles and a little more jiggle – because plus-size women are training for strenuous athletic events in record numbers. 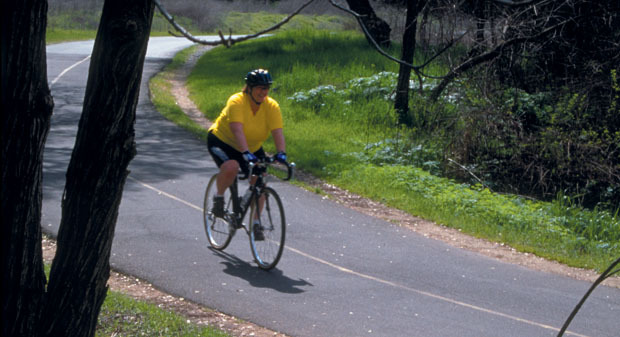 Like any other athlete, the plus-size marathon bike rider, runner, or power walker probably began her athletic journey innocently enough, by deciding to hop on a bike or take a stroll for pleasure and fitness. But strolls soon turned into hikes and short spins to the neighborhood park became trans-city excursions. At some point along the way she began to self-identify as an athlete, and eventually her inspiration and motivation combined to galvanize her to sign up for an endurance event. Anita Mower, 39, wasn’t much of a bike enthusiast when she was a kid. But this spunky redhead has more than made up for lost time, having racked up a 150-mile bike ride as well as numerous other distance events in the four years she’s been cycling. Mower devised a training regime for the MS150 after seeking out recommendations for century (100-mile) training in cycling magazines. Her workouts consisted of one sprint day, where she would ride at top speed for a certain number of minutes, followed by a rest day, followed by a day where she would complete a long ride. Over time, Mower increased both her minutes and her distance, and as the date drew nearer, rode one 65-mile course and did several long rides back-to-back, mimicking the conditions of the two-day event. While some plus-size athletes, such as Mower, train on their own, others – such as this writer – work out at their local gym. While my gym attracts women of all sizes, I noticed that the big girls were not participating in some of the more popular classes such as cardio-boxing and spinning (group indoor cycling). Instead, I saw trim – even skinny – folks participating in these new exercise fads. So it was with great trepidation that I approached an indoor cycling instructor and simply asked, “Can big girls spin?” After being assured that I could participate and work at my own level, I began the class routine of pre- and post-stretching, and covering between ten and 15 miles on a stationary bike. Then a most curious thing happened. Other large women at the gym began to approach me and ask about spinning. They all confided the same thing to me: They had never seen any big folks spinning. I encouraged all of them to join one of the classes. After several months of spinning, other aerobic exercises (EFX machine, treadmill) and lifting weights, I saw an advertisement for the California AIDS Ride, a 560 mile, seven-day bike ride from San Francisco to Los Angeles. 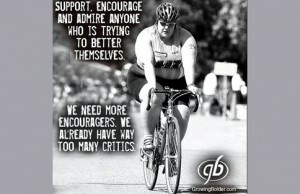 The thought occurred to me that, if big girls can spin, then they (we) can certainly train to ride a bicycle 560 miles. Despite the fact that in the last 20 years I have not ridden my bicycle more than three miles in an outing, I signed up for the June 1999 ride and began training in earnest in last December. Around that time, I met Mary Buckner, a plus-size woman who attended one of my spinning classes. Mary told me that she planned to participate in the Escape to Alcatraz Triathlon in 2000. Mary said that when she goes to aerobic classes, “they are surprised that I can keep up,” and that sometimes folks “kinda do a double take.” Buckner expressed some familiar sentiments about exercise, in that she thought, “big people only exercised when dieting.” It only recently occurred to her that “exercise is a lifestyle,” and although weight loss might be a byproduct of exercise, the primary goal is fitness. Although Buckner began to envision exercise as a lifestyle, she also wanted a challenge, something to excite her and push her further. She watched the Ironman competitions on television, found them challenging and decided to enter a triathlon – not to win, but to complete it as a personal challenge. She felt the competition was a motivator to encourage her to get in the best shape she could be in, and wanted to prove to herself that she could do it. Cinder Ernst of the World Gym in San Francisco has taught a class for plus-size women for several years. “The gay rights movement became successful after people realized that being gay is not a choice. You either are or you aren’t. People think larger people choose to be that way, but genetics plays a part,” said Ernst. People she has known have lost 100 pounds, but they are still heavy: “That’s all they’re going to lose.” One of her clients lost 120 pounds, but still weighing 270, walked a marathon without losing a pound. The underlying sentiment behind the 24-Hour Nautilus billboard is that fitness and fatness are mutually exclusive. And, while the National Institutes of Health claims that over half of the U.S. adult population is either overweight or obese, exercise physiologist Dr. Glenn Gaesser of the University of Virginia believes, as other experts do, that “Ideal weight is really a statistical myth.” Gaesser, the author of Big Fat Lies: The Truth About Your Weight and Your Health, draws the conclusion that weight isn’t the issue or problem, but that being unfit is. He says that the issue is one of health, regardless of size, and that the key to health and fitness is to improve diet, eat more fruits and vegetables and exercise – regardless of whether these activities result in weight loss. Vejkajs decided to train for a 28 km (16.4 mile) walk in 1998 after she finished a 10 km (6 mile) Super Cities Walk for Multiple Sclerosis. Her workout schedule is divided into seasons: winter (walking 30 minutes three to five times a week) and spring/summer/fall (walking 30 minutes to one and one-half hours five times a week and bike riding 30 minutes two to three times a week). Although plus-size athletes are on the move in triathlons, marathons and long distance bicycle rides, obstacles do crop up in their attempts to achieve their dreams. Upon joining a gym, Vejkajs found that “the staff had a hard time understanding that I was not there to lose weight, but to get stronger and more fit.” She also notes “looks of surprise on people’s faces” when she tells them of her training plans. And while Mower’s spring plans include participating in the 50 km (30-mile) Party at Pardee, a celebration of the “official” opening of bike season by 1200 riders, she may not have a fresh jersey and bike pants for the new season. A size 2X, Mower says, “It’s a constant challenge to find bike clothes that fit and that are comfortable for me to go on a long ride.” While the Junonia and Nashbar catalogs sometimes carry the special bike pants with a chamois, or pad in the seat, finding bike equipment for plus-size women can be hit-or-miss. And that’s the bottom line. As plus-size women, we’re often given the message that we can’t be active or consider ourselves athletes. But by setting our own goals and workout routines, or by joining a gym, we can add a little jiggle to the hardbody image of an athlete. And in the process, we’ll give ourselves the wonderful gift of physical, emotional, and mental well being. Because we can.